ANNOUNCING: Your chance to win a limited-edition print! Would you like the chance to win a personally-signed artist’s print of a painting depicting a historic CNR steam excursion? On the weekend of September 26-27, 1964, the Canadian National Railways staged an unforgettable pair of steam excursions. Both of these trips were sponsored by the Upper Canada Railway Society. They featured the last two runs of Northern 6167 and the first two excursion runs of newly-overhauled sister 6218. Recently, one of our Mainliners commissioned Canadian railway artist David Oram to depict a scene from the first trip of the historic weekend. Canadian National Railway Company 4-8-4 Northerns #6167 and #6218, lead an Upper Canada Railway Society trip on a rainy September 26, 1964. 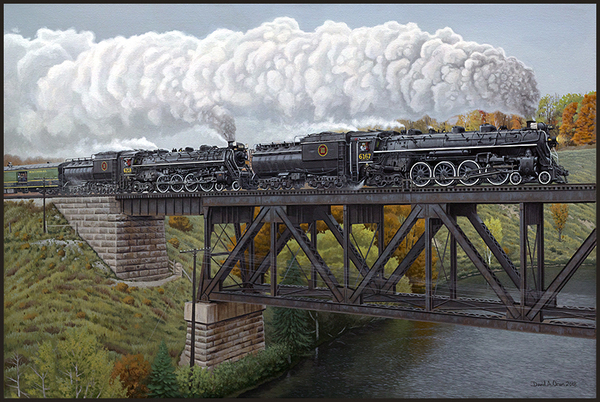 The painting depicts them crossing over the south branch of the Muskoka River near Bracebridge, Ontario, as the train heads southbound towards Toronto. You can visit David Oram’s webpage devoted to this painting. Now, I’m here to announce a special draw. We will enter your name once for every copy of Speed Graphics and Steam 1958! vol. 1 which you pre-order. On Sunday, May 12, we will draw a name to determine the winner of the artist’s print of Northerns Over the Muskoka River. Anyone who has already pre-ordered one or more copies of Speed Graphics and Steam 1958! vol. 1 has automatically been entered in the draw. Immediately after holding the draw, we will announce the name of the lucky recipient in an email broadcast the same day (Sunday, May 12). Then we will put the winner in touch with the artist to arrange for the print to be personally-inscribed and then shipped! For this draw, we will accept online pre-orders for Speed Graphics and Steam 1958! vol. 1 until 11:59 p.m. Tuesday, April 30, 2019. For mail orders, we will accept envelopes with payment postmarked April 30 or before (we will wait a few days for them to arrive, but please don’t delay if ordering by mail because we may hold the draw before your order arrives). To be eligible to win the signed print of Northerns Over the Muskoka River, pre-order at least one copy of Speed Graphics and Steam 1958! vol. 1. At the same link you can download and print a form for mail order. Or dig out that brochure we sent you by postal mail a little while ago. Best of luck in the draw to all Mainliners and Branchliners!